This website concerns electronic organs and musicians who played them. There are some pipe organists who also performed on electronic instruments. Jesse Crawford was one of these. While in an orphanage near Woodland, California, Jesse taught himself to play the harmonica, cornet and piano. At the age of 14, he left the orphanage and played piano with a small band up and down the West Coast. This was followed by a nickelodeon, which led to theatre work and his transition from piano to organ. This work brought him to Billings, Montana and Spokane and Seattle, Washington. Some work then followed in San Francisco, California before he relocated to Chicago, Illinois. While playing at the Chicago Theatre, he met Helen who played at the Roosevelt Theatre down the street and the two were married. The Chicago Theatre then added a second console to their Mighty Wurlitzer, and the Crawfords played duets with them. Then Jesse moved to New York at the Paramount Theatre. 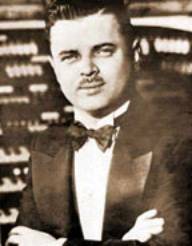 In 1936, Jesse started gigging around Chicago and discovered the Hammond organ. Often, Helen performed with her husband on a second Hammond. Jesse made many records on the Hammond organ from the early 1940s to the mid 1950s, then returning to the pipe organ. In 1943, Helen Crawford passed away and Jesse married Lucy who had no ties with music whatsoever. Around 1950, Jesse started teaching organ. In 1940, Jesse took organ lessons from Joseph Schillinger, who had previously taught such musicians as George Gershwin and Glenn Miller. Jesse Crawford also published music books of his arrangements for Hammond organ. Jesse Crawford is indeed the “classic” theatre organist. His hallmark was the “tibia rolls” with the Tibias 8’ and 2’ in open harmony. His playing of semi-classics was superb. Most of his records were of sentimental, smooth style but he could really swing as well. He designed organs for Wurlitzer, one of the most notable being formerly at the Uptown Theatre in Chicago. There is even an album of organ player rolls that he cut for WurliTzer player organs.